thexuberant1 posted a message on Favorite Pokémon Sprite Style! 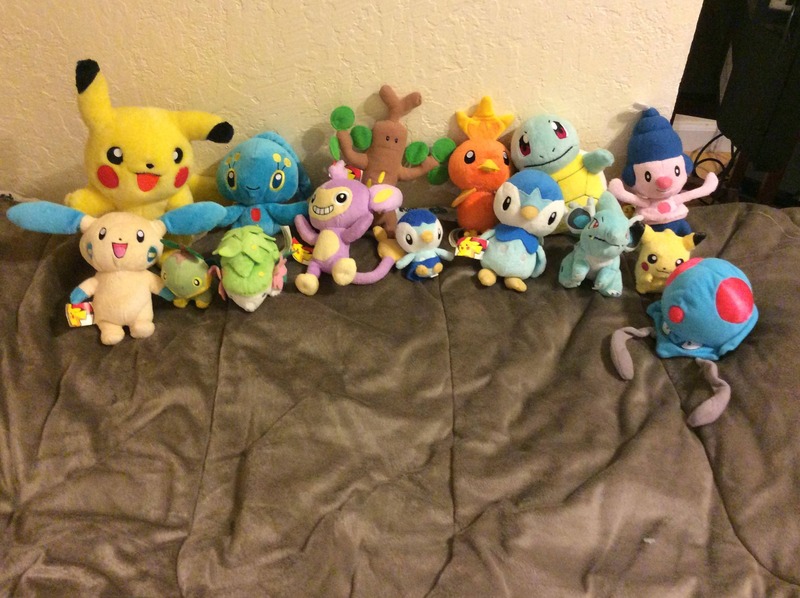 thexuberant1 posted a message on Share your Pokemon plush collection! thexuberant1 posted a message on Snivy, Tepig, and Oshawott! Which Unova Starter is your favorite and why? My favorite is Tepig because I like pigs. thexuberant1 posted a message on Azurilland Top Fives! thexuberant1 posted a message on Did you role-play as Pokemon or Pokemon Trainers when you were young? Ya, I used to role play as Pokémon with my brother and his friend. I was Empoleon. thexuberant1 posted a message on Who's YOUR favorite Legendary? My favorite legendary is Suicune cuz it's so majestic and I love many water types. I also like Giratina, Shaymin, and Xerneas. I never cared about the small selection of fire types in Sinnoh. Platinum has a few fire Pokemon, but so what? Besides Blaziken, the Hoenn games have only four fire types to choose from - Magcargo, Camerupt, Torkoal, and Ninetales. I used Rapidash before as well as Magmortar. They're both very good. thexuberant1 posted a message on The New Unova Pokédex! I really like the New Unova Pokedex! While I do love many Gen 5 Pokemon, it was nice to have a variety of older Pokemon to choose from in Black 2 and White 2. It's also more diverse when I have both new and old Pokemon on my team. I think having only new Pokémon wouldn't be good to do again since many older fans aren't familiar with the new Pokémon. I prefer having a big regional Dex. thexuberant1 posted a message on Poll #145 What is your favorite cave in the Pokemon World (Hoenn, Sinnoh)? I like Mt. Coronet the most cuz I liked climbing to the snowy areas of the mountain. My second favorite is Meteor Falls, it's so vast and beautiful. Giratina is my favorite. Latias and Latios have a nice shiny form too. thexuberant1 posted a message on Poll #142 What is your favorite desert? My favorite is Route 228 in Sinnoh. It's a good place to train my Pokemon cuz it has many strong trainers. The others can be annoying, especially Haina Desert. Searching for Tapu Bulu in that place was EXTREMELY frustrating ugh. thexuberant1 posted a message on Most Forgotten Pokemon? Chesnaught and Delphox are very forgettable. Greninja takes away too much attention from both of them. I really like the Stat Trainers! It was fun teaming up with them. My favorite is Cheryl cuz she's friendly. Also, her Chansey is so chubby and cute! thexuberant1 posted a message on What is your favorite Generation Four Pokemon? Gen 4 has many awesome Pokemon, it's hard to pick a few as my favorites. thexuberant1 posted a message on What do you love most about the gen 2 games? I love the Gen 2 games! They're so fun. My favorite features are the day/night cycle and the post-game content. Traveling to Kanto was awesome! I also love breeding, genders, two new types (dark and steel), and baby pokemon.